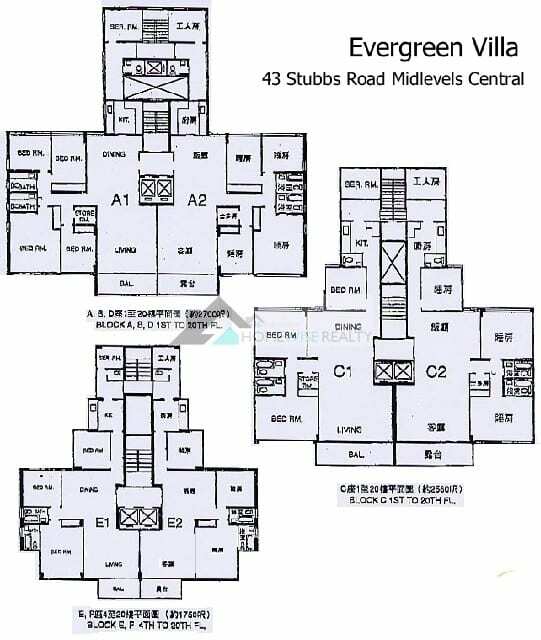 [feedzy-rss feeds=”https://homewise.hk/properties/evergreen-villa/” max=”5″ feed_title=”yes” refresh=”12_hours” sort=”date_desc” meta=”yes” summary=”yes” ]Evergreen Villa comprising of 6 blocks funtional apartments located on upper Stubbs Road, close to the running trail of Bowen Road. It has a total of 218 apartments and blocks A&D are 2363 sf salable and have large balconies overlooking Happy Valley and the city. Blocks A&C are 20 storeys with block B&D, 21 & 17 respectively. Blocks E&F are each 16 storeys with apartment size 1525 sf salable. All blocks have 2 apartments per floor. Blocks A&D were originally all 4 bedrooms but some are now converted to 3 bedrooms. They are well proportioned with large rooms and good storage. It is a predominately residential area of Hong Kong Island. The first part of Stubbs Road above the Adventist roundabout can also be included in this district, including the two huge and visible towers of Highcliff and The Summit. Accommodation is varied, from smaller units in older blocks such as Monticello in Kennedy Road, to the spacious units of Borrett Mansions. A large development called Bamboo Grove is very popular with expat families.